Somehow I will justify my pickings as breakfast and by the time lunch rolls around I’m starving while sitting at my computer editing and wondering why heck I’m hungry, hits me—oh yeah, I forgot to actually eat a real meal so I quickly slap some almond butter on a piece of paleo toast, top it with my favorite fruit and call it a meal. On days that I take off of work and have time to make myself breakfast, I eat the same thing (unless I’m feeling spunky and make myself a large stack of pancakes) and I will without fail have toast with almond butter and topped with bananas. It’s really very tragic and boring when you think of the kind of work I’m in. I mean, I create food for a living! I really should get a better handle on this breakfast thing but perhaps you underestimate my love for nut butter toast—I’m a little obsessed. 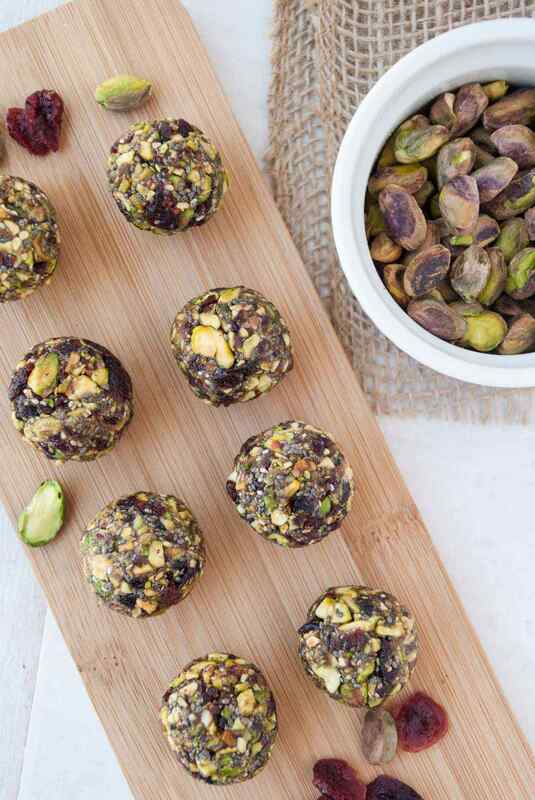 This week though, continuing with my no-bake energy ball creations, I haven’t been hungry one bit because snacking on these little babies keep me energized (hence energy bites) and full until lunch time when I have my usual almond butter on toast and topped with none other than bananas. That’s a win for this week’s baking ventures. 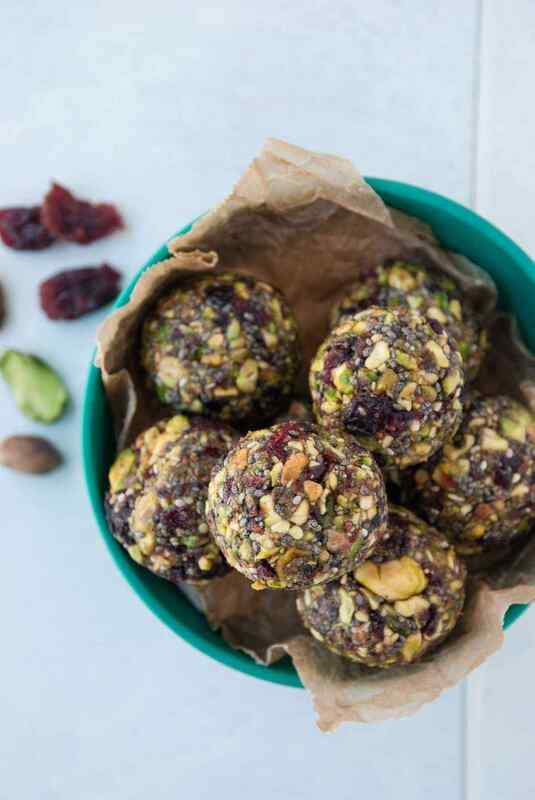 In case you are wondering why these little delights are called “energy balls”, it’s because of the most obvious reason—all the fuel these delicious bites provide. 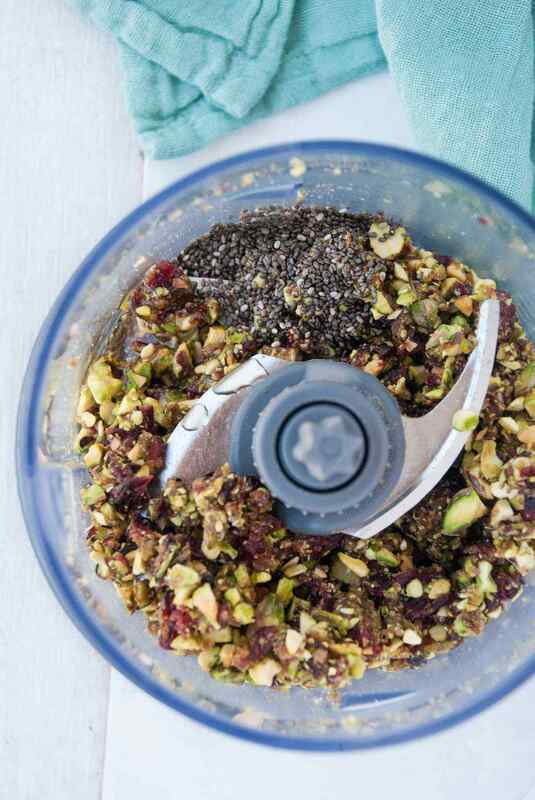 These bliss balls are loaded with chunks of pistachios, cranberries, dates, chia seeds and honey—all natural ingredients rich in vitamins and minerals to keep you full and energized throughout your day. Since I started snacking on these little energy bombs, I no longer have that desperate feeling during the mid-day when my work starts to wind down that I need to take a nap. Thanks to these energy balls, I’ve powered through my day and found myself being extra productive and making it to the gym more often than I had been.